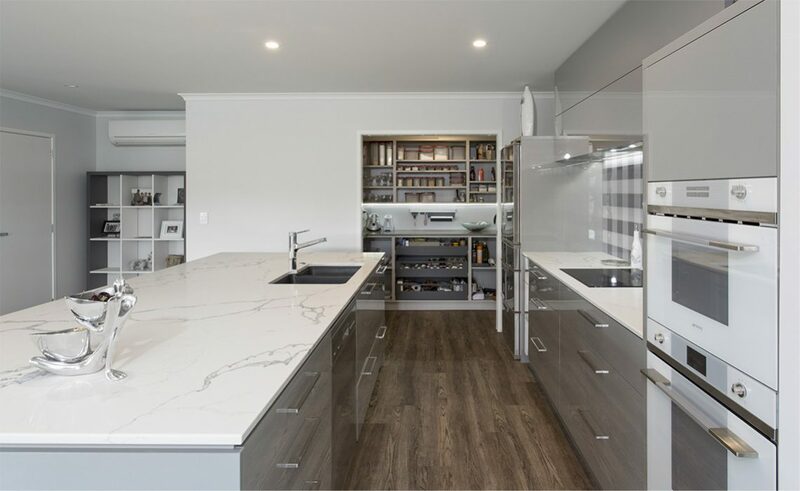 This elegant minimalist kitchen is designed to provide the owner – a busy designer – with a practical, hard-working kitchen that works almost as hard as she does. 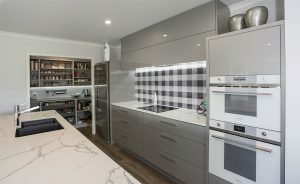 This kitchen is at one with the house. 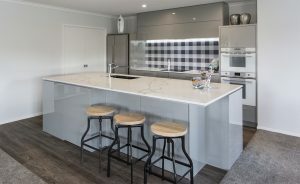 Even wallpaper from an adjoining room was photographed and digitally printed onto the glass splash-back providing continuity between rooms. 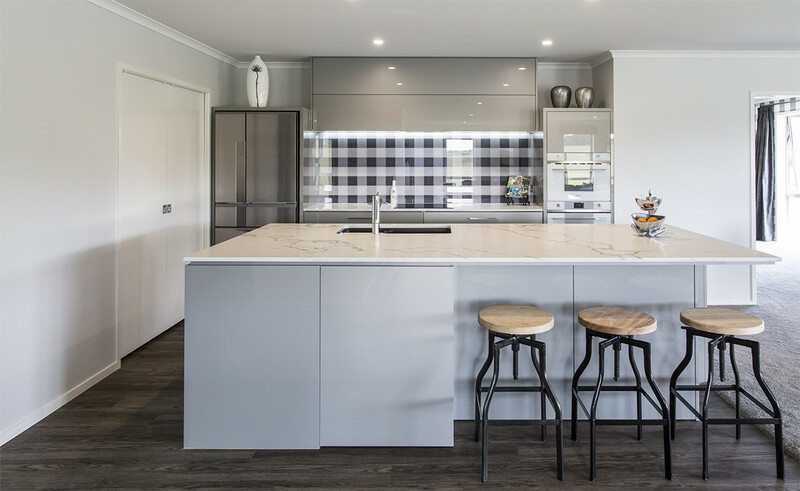 The oversize central island provides a centrepiece for entertaining as well allowing extra space for cupboards on the seating side for low-use items. Both the island and the hob are capped with 20mm Smartstone Statuario. 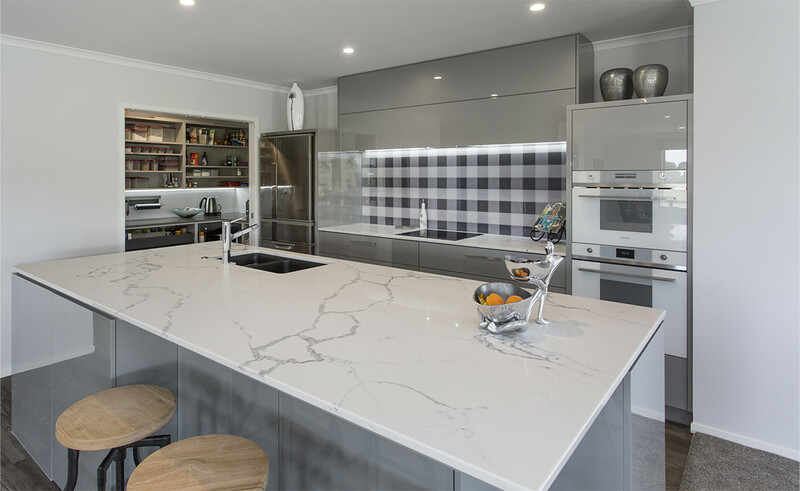 An 18mm negative profile gives the island a sleek, floating look. 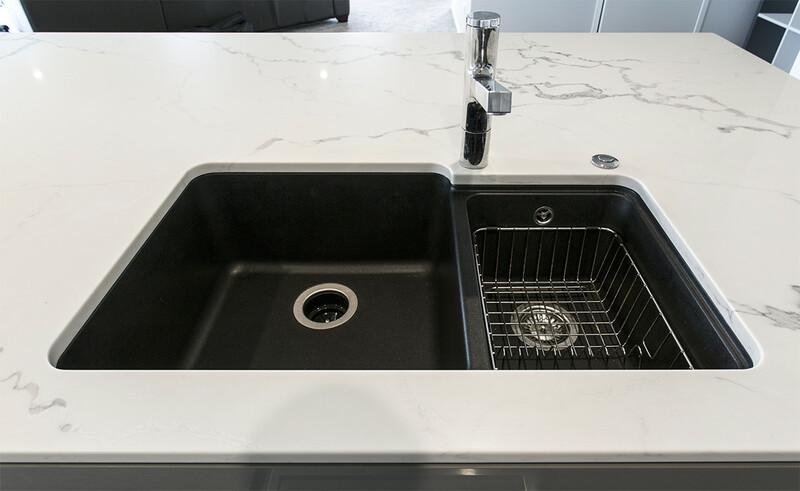 A Blanco Anthracite sink with large bowl is both practical and easy to clean down. 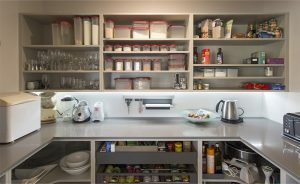 The hide-away scullery features double cavity doors allowing it to fully open up to the kitchen when in use so the cook is not away from the main living space. 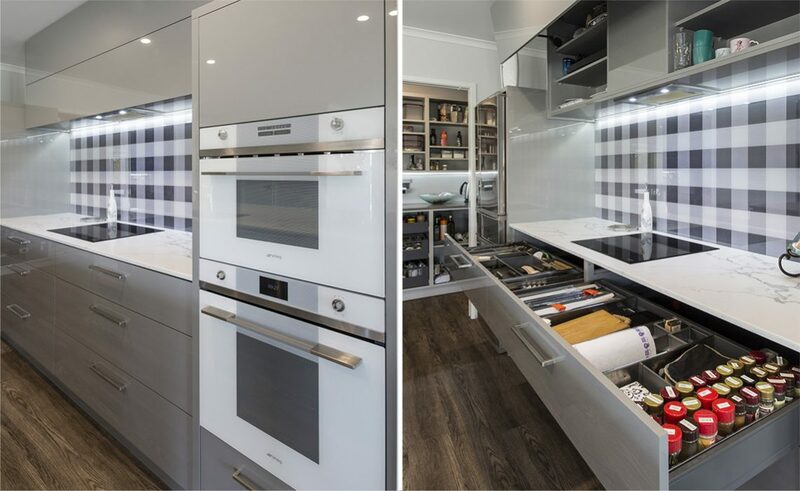 The long cabinets above the cooking area were designed to showcase their clean lines with support from Blum high-lift hinges. LED strips under the power pack provide excellent task lighting. To the right of the wall-side cabinets, an oven cluster features SMEG white line ovens, chosen to go with the grey and white colour palette. The SMEG 60cm Pyrolytic oven and Microwave Convection half oven nicely complement the SMEG induction hob. A Baumatic 12-bottle wine fridge, Mitsubishi multi-drawer fridge, dishwasher, and waste disposer make up the collection of quality appliances. 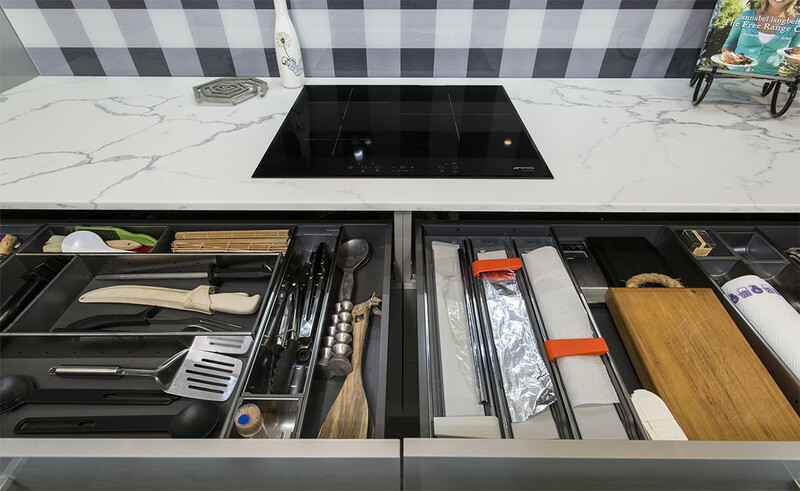 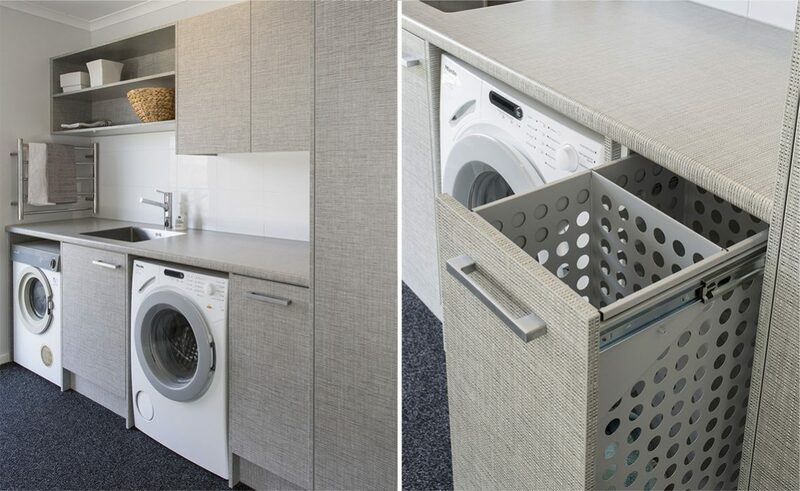 All drawers feature Blum Legrabox soft-close mechanisms and are kitted with Orgaline inserts. 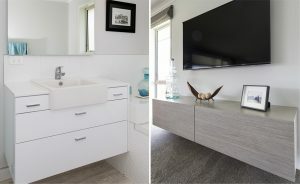 Mastercraft Kitchens also designed and fitted the entertainment unit and laundry cabinets. Like what you see? Call in and have a chat to your local Mastercraft Kitchen designer and see what we can do for you. 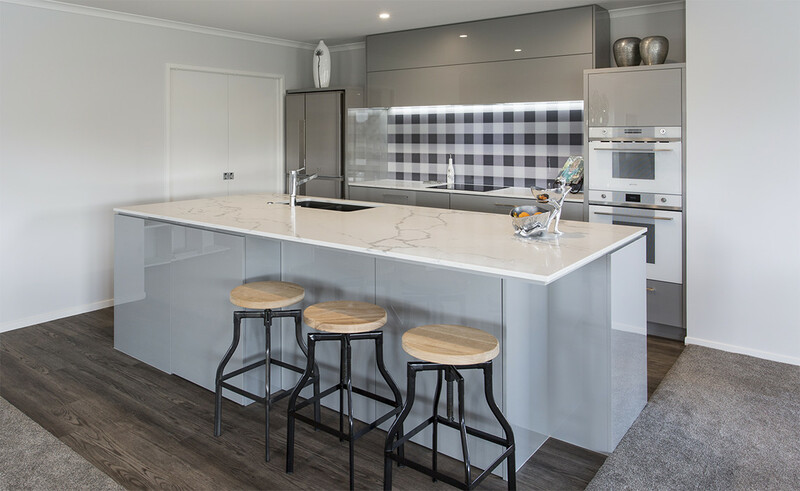 This kitchen featured on TV3’s The Cafe – check it out here.